Given the desire to shrink its carbon footprint, many gyms have begun to retrofit cardio machines with energy-producing generators. 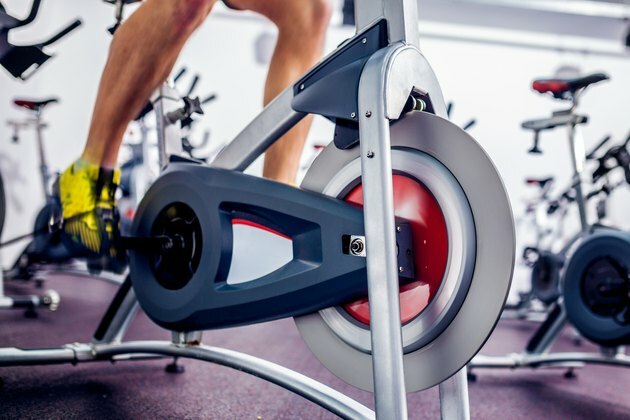 Because these machines only generate a small amount of power per user, gyms connect many machines and users to recoup the cost of the generators. For a single user at home, the meager power output makes the generator expensive from an economic standpoint. However, you can build a cheaper pedal-powered energy generator, which can power some home devices and partially offset your electricity bill. Cardio machines -- stationary cycles, treadmills and ellipticals -- generate resistance while you exercise. The resulting friction produces heat, which can be converted into energy via a generator. A typical cardio machine contains resistors that eliminate this heat. An external generator can replace the resistors and take in the DC power produced by the machine. According to Tom Gibson’s 2011 article “These Exercise Machines Turn Your Sweat into Electricity” on IEEE Spectrum, an inverter in the generator transforms the DC power into AC, which then feeds your home’s electrical system and the power grid. Because the generator is an add-on, you can retrofit existing exercise machines. You can also connect several cardio machines to one generator -- a system that appeals to gyms. Some companies have custom-designed power-producing exercise machines, but they'll make a bigger dent in your wallet. When you rigorously pump the pedals of a power-producing stationary cycle for an hour, you’ll only produce 50 to 150 watts, says Gibson. A professional cyclist can generate up to 400 watts. On average, 100 watt-hours can power a laptop for two hours, an iron for up to six minutes and a 15-watt fluorescent bulb for six hours and 40 minutes, according to “Mother Earth News.” In the U.S., commercial power costs about 10 cents per kilowatt hour. If you exercise an hour per day for 30 days at 100 watts per hour, you’re shaving 30 cents per month off your electricity bill. Given the expense of the machine, it may be more economical to invest in other energy-saving measures, such as solar panels or insulation. You can build a stationary cycle that will be more efficient and less expensive than commercial power-producing machines. By replacing the friction drive of the standard cardio machine with a chain drive and adding a flywheel, you can boost the energy generated. San Jose-based David Butcher constructed a pedal generator that resembles a stationary cycle and provides the same workout. Although Butcher’s version still uses a friction drive, his machine is powered by a wooden flywheel -- which functions like a bicycle wheel with ideal tire pressure -- and is 25 to 50 percent more efficient than a cycle on a stand, according to “Low-Tech Magazine.” Butcher uses his pedal generator to charge a razor and phone, light a computer monitor and power both air and water pumps. The less electricity you use, the more pedal power contributes to overall power needs. Butcher has already outfitted his home with a 2.5-kilowatt solar array and is a net supplier of power to the local utility. So what little extra power he needs, he produces in a morning workout on his pedal generator. If the technology of power-producing machines takes off and millions of people use them to generate a small amount of energy, total energy can be significant. Investors perceive this technology as similar to compact fluorescent bulbs or solar power -- dismissed early on but now becoming more mainstream. The New York Times: How Powerful Is Your Workout?